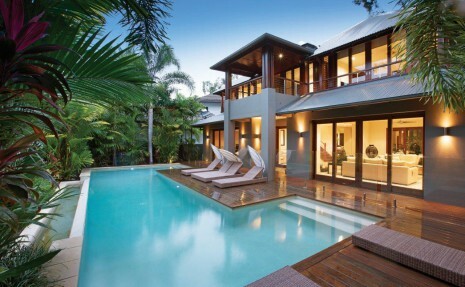 Luxe Houses is pleased to have two luxury escapes in Port Douglas. Rather than doing a broad overview of all the properties in Queensland, we thought it’d be best to go more in depth on two of the properties in Port Douglas as well as an overview on Queensland. Other than The Gold Coast, Cairns and Port Douglas are regarded as the next highly sought out locations for people to target as luxury escapes in Queensland. Port Douglas is at the centre of many things in Queensland. Only an hour away from Cairns and surrounded by the Great Barrier Reef and Daintree Forest as well as its own Four Mile Beach, there is so much to do, hence why it is such a popular travel destination for holidays. The Molori and Dune Port Douglas are the two current holiday houses in Port Douglas. The maximum amount of people allowed is ten for the former and six for the latter. Sandwiched in between the Great Barrier Reef and the Daintree rainforest, the Molori is a private hideaway while Dune Port Douglas is an exclusive Beachfront Mirage Estate that is Port Douglas’s largest holiday home. The Molori is closer to the Four Mile Beach while Dune Port Douglas is closer to the heart of the town. Both have ridiculous amounts of choices in regards to concierge service, where to go and how to indulge in pure relaxation. It’s almost as if these houses are too good to be true. Luxe Houses proudly endorses these two properties. This is more than just being about Luxe Houses. We really try and identify places that people would really want to stay at. It’s all and well to have a wide range of properties that look very nice but once you start combining that with an excellent location, well, that’s when the magic happens. Staring out into the open sky at night, a calmness is brought out in you. All the senses become heightened. If you feel like you’re ‘living it up’ then we’ve done our job and there’s a good chance you won’t want to leave these luxury escapes in Port Douglas when your stay comes to an end.